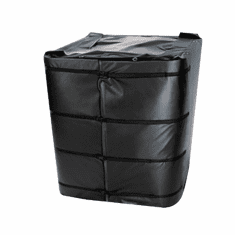 This Insulated Lid measures 41 inches in width x 49 inches in length and will fit both the 275 or 330 gallon totes. Each corner has a short drawcord and brass eyelets for tightening the lid in place. 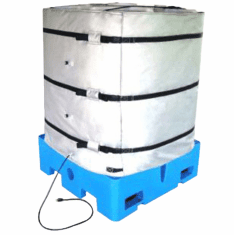 This Insulated IBC Lid is used in conjunction with the IBC Blanket (Part #8IBC1). Each side covers the entire top of the IBC Tote and has a 4" downflap around the edges that fit over the bottom blanket portion. This design helps the IBC blanket heater to contain heat for added efficiency heating your material in the tote. 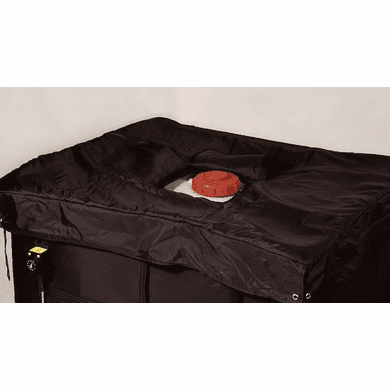 This optional insulated lid for use with the flexible heating jacket for 275 gallon IBC totes SKU #8IBC1 helps to contain heat for added efficiency and sits on top of the 275 gallon IBC with a 4 inch skirt around the edges This lid is equipped with a center top opening flap for access to the center fill cap of the IBC unit or tote. There is no electric power. Brass eyelets are in each corner of the lid with short drawcords for tightening in place. The lid measures 41-inch x 49 inches.